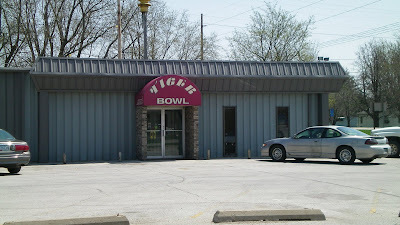 This Bowling Alley is named for the Football Factory High School just a couple of blocks up the street. The Madrid Tigers roll over the other small schools every fall, and this tenderloin takes no prisoner's either. 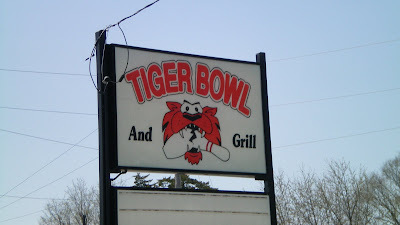 Its the real deal, and its found in a funky bowling alley. Location: 205 Annex Road, at the intersection of the two major roads in town. Directions:Madrid is about about 20 miles north and west of Des Moines. Take Highway 141 to Granger, then north on Highway 17. The Tenderloin: This was a complete surprise. I did not come here with high hopes, but this is close to award-worthy. 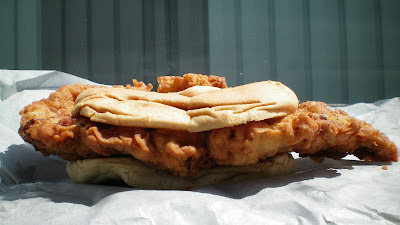 The breading has a few different shades of brown, and a hint of pepper in it. 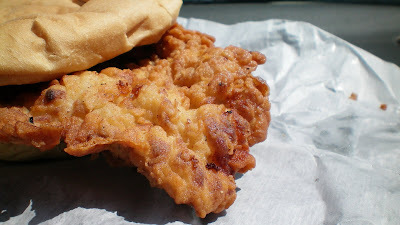 The breading formed bumps above the pork inside. The overall softness of the pork inside was the best part of the sandwich. It had enough moisture, and the whole thing had a floppy nature when I picked it up. Its a good size, with a little curvature from the frying process. Only a small amount of fat wasn't trimmed off before cooking. Oil from the sandwich soaked through the two wrappers around it into the brown paper to-go bag. Served on a toasted bun. 8/10. Also on the menu: During the week there is a pizza, salad, soup buffet. There is also the usual assortment of fried stuff, including cauliflower. Service: I think its just two guys running the entire operation when I stopped in. That includes baking pizza and running the bowling area. Ambiance: You are asked to wipe your feet upon entry, something other establishments should require as well. There is a dining area walled off in a corner, and tables in front of a big screen TV and the bowling lanes. The thunder of bowling balls is a constant. There were a couple families eating pizza with kids running around. Final Thoughts: I hadn't walked into a bowling alley in years. 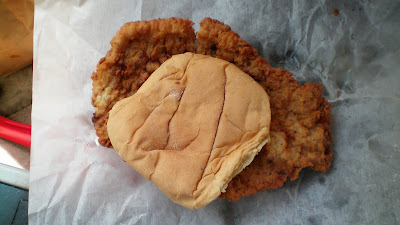 After finding this tenderloin, I have to make the rounds to each one in town to see if others make their own. Its definitely worth the stop during the drive from Des Moines to Ames or Boone.